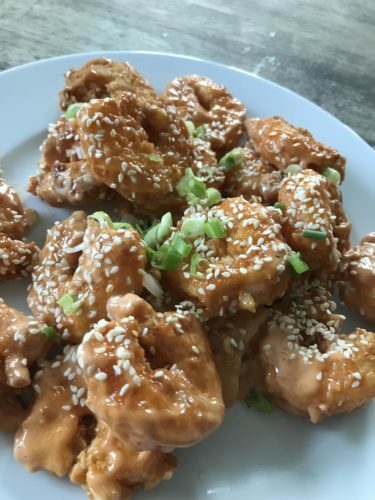 Bang Bang Shrimp… Boom Boom Shrimp… what ever you call it, it’s AMAZING! I was so excited after a co-worker told me about this recipe by 40Aprons. 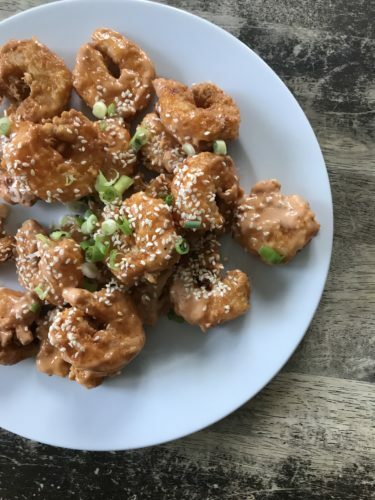 This spicy shrimp recipe immediately registered as my kinda food! Since I didn’t have all the paleo-friendly ingredients on hand, I decided to make my own version with what I did have in my pantry. The final product was a truly scrumptious shrimp dish that makes a fun appetizer or even a quick weeknight dinner. One of my kids kept calling it “Boom Boom Shrimp” so I decided my version should pay homage to both versions. Combine mayo, ketchup, Sriracha, soy sauce and garlic in a medium bowl and whisk to combine and set aside. Place beaten egg in a bowl. In a separate bowl, whisk together flour, cornstarch and salt. Working in batches, dredge the shrimp in egg wash, followed by flour mixture. Shake off excess flour and place shrimp on a plate or sheet pan. In a large skillet heat oil to 325 degrees F. Place 4 or 5 shrimp at a time in the skillet and cook for 2-3 minutes per side until golden brown and shrimp is opaque. Remove from oil and set on a paper towel lined plate or sheet pan to drain. Repeat with remaining shrimp. Once all shrimp are cooked, add them to the bowl with the sauce and toss gently to coat. Pour on to a platter and garish with sesame seeds and scallions. Serve immediately.